DAI was yesterday named an award winner at the 17th annual conference of the Global Equity Organization (GEO), a professional membership organization dedicated to advancing understanding of employee share plans. DAI won in a new award category, Best Use of a Share Plan in a Private Company. 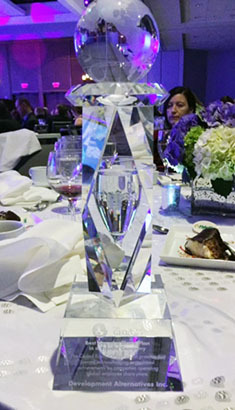 “We are delighted to receive this honor,” said DAI Senior Vice President of Human Resources Laura Viehmyer, who accepted the award on DAI’s behalf at a gala event held at the Boston Marriott Copley Place hotel. According to GEO, winning companies are recognized for designing, communicating, or offering programs that allow employees worldwide to participate in their company’s share plan. Last night’s winners include Google (Best in Financial Education), Unilever (Best Plan Communication), Siemens (Best Plan Effectiveness), and Amazon (Best Use of Technology). Previous years’ winners include Accenture, Cisco, Vodafone, and Starbucks. DAI has been employee-owned since its inception in 1970, and over the years broad-based employee ownership has become fundamental to the firm’s culture. But until February, ownership was limited to U.S.-based employees via its Employee Stock Ownership Plan, or ESOP. As DAI expanded its global footprint, the DAI Board and leadership team worked together to explore a new ownership structure that accommodates this increasingly global workforce. In the new, more inclusive framework, the ESOP is now complemented by an active ownership option available to all global corporate employees. Of the more than 500 employees eligible to participate in the new investment opportunity, 80 percent elected to do so. DAI would like to acknowledge the professional contributions of ButcherJoseph & Co. and Global Shares to the creation and management of its new employee ownership program.